I could tell we were zeroing in on That Most Wonderful Time of the Year when Santa Monkey, Rudolf and Mr. Moose came out of the storage bin and into the living room. Stockings and lights were hung. And the best part: My favorite big brown truck started coming more often. December must be some kind of mating season for the big brown trucks; I’ve seen them congregate in the parking lot of the former Bill the Butcher store at the bottom of our hill, rear end to rear end, in broad daylight. I’m certain something’s going on. My personal favorite UPS driver has lots of deliveries in our neighborhood. More than once, Mike and I crossed paths with his truck before we even got to our corner. Of course, Mr. UPS throws two biscuits my way every time. So after I scarf them off the pavement (unless Mike grabs one first so I don’t wolf them down), we don’t walk towards the park as usual. 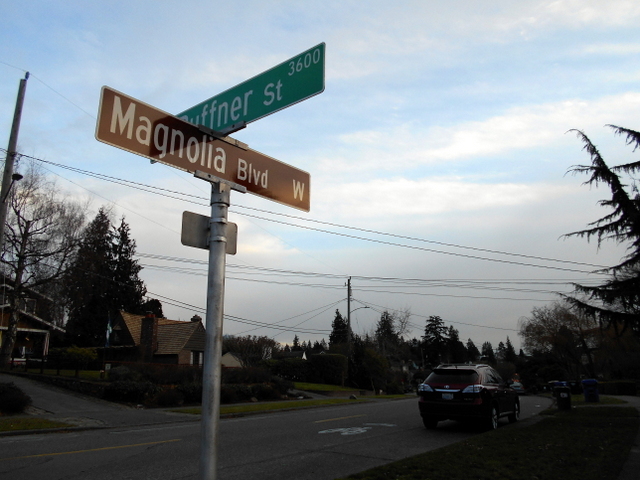 Instead, I lead Mike along Magnolia Boulevard and its cross streets, hoping to meet the brown truck again. Even when I can’t hear it, its scent hangs in the moist December air. Or maybe it’s the scent of Milk Bones. So for the past few weeks, I kept dragging Mike through the neighborhood, noting the tasteful light displays and chortling at the ugly ones. If I sensed we were closing in on the truck, I’d start to walk faster, but I had to be careful, because if Mike saw the truck before I did, he tried to steer me in the wrong direction. If I spied it first and got some forward momentum, however, there was no stopping me. 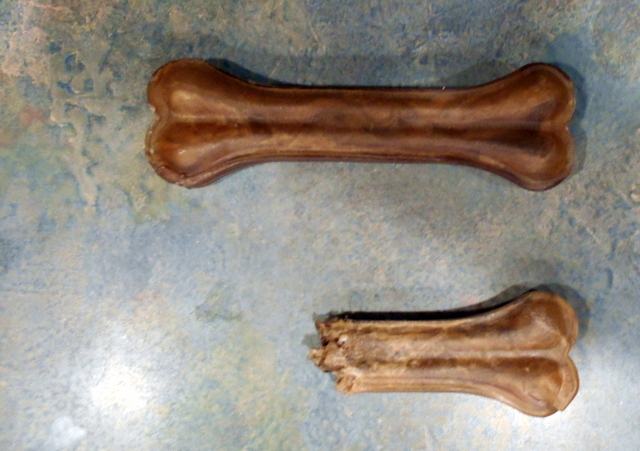 One day I caught him twice, and Mr. Brown gave me double Milk Bones both times. I call that my Ghost of Christmas Past moment. 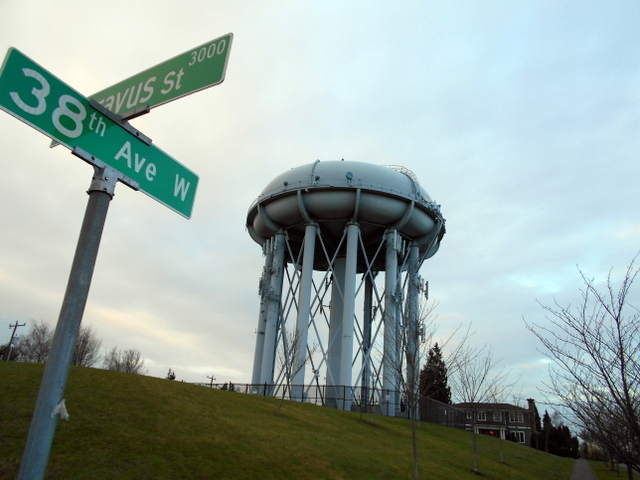 At the other extreme, my version of the dreaded Christmas Future: One day a big brown truck roared up the street near the water tower on Dravus, a favorite destination of mine. I waited for it by the curb, expecting two biscuits to fly my way. But the truck went right past me, turned the corner and stopped. I dragged Mike across the street after it, and sat on the sidewalk between the truck and the house, waiting expectantly. In the truck were a driver and a runner, neither my guy. The runner smiled, told me I was cute, but shook his head sorrowfully. “No treats,”he said, showing me his empty palms. The truck drove down the block and stopped again. I followed, and sat. The first time must have been some kind of mix up, I figured. Nothing. After I repeated this futile exercise a third time, I finally believed it. 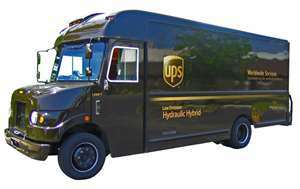 I let the truck drive off, but I was hardly done: I ordered Mike to write down the truck number, and I will be reporting this incident to UPS world headquarters in Atlanta. Two biscuits should be a right, not a privilege. I’ve noticed several boxes arrived on our own doorstep of late, some of them even left courtesy of my own Mr. Brown (while I was apparently napping soundly? At least he left biscuits!). Maybe something arrived for me and Mike and Heather are hiding it until the big day. I’m confident, actually. I know I’m going to go to bed on Christmas Eve with visions of new toys and treats dancing in my head, and I fully expect to be rewarded in the morning. I mean, how good does a good dog have to be? My Christmas stocking didn’t stay hung up by the fireplace for long. Mike and Heather planned to dole out my gifts one or two at a time. But as soon as my over-stuffed stocking moved from the mantelpiece to the fireplace utensil stand, putting it within my easy reach, I yanked it to the floor and pulled out all the gifts inside. Patience is not among my highest virtues. Heather’s “no-presents” rule doesn’t seem to apply to me, which is OK as far as I’m concerned. 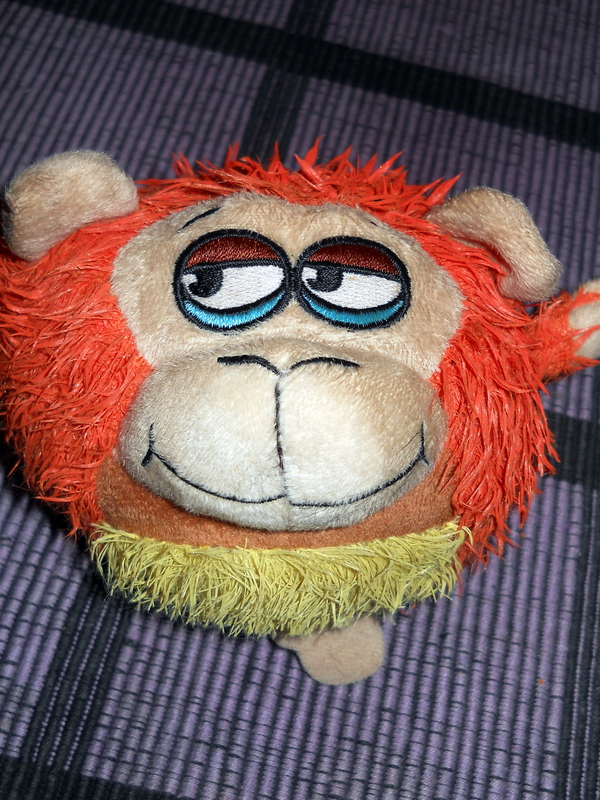 Heather, in fact, was my major benefactor this holiday, giving me three new toys: stuffed Santa Monkey, an orange rubber bone that squeals when I bite it, and my new favorite, Krinkles. I’m not sure what to call Krinkles. It’s a soft, round, flat discus stuffed with something that sounds like cellophane when you crinkle it up in your hand. Krinkles has a red fabric exterior with a snowflake on one side, and it looks like it would be real easy to rip up in about 10 minutes. Au contraire; so far I haven’t been able to separate even one seam– and I’ve tried, as you might deduce from my warrior fangs in the photograph above. Chilling with Penny during the Pinstripe Bowl. The orange plastic frisbee that my buddy Penny gave me didn’t have the same staying power, I’m afraid. The moment that Mike wasn’t looking, I grabbed it and chewed through about a third of it before Heather caught me. We didn’t even get a chance to take it outside and throw it. Sorry, Penny. 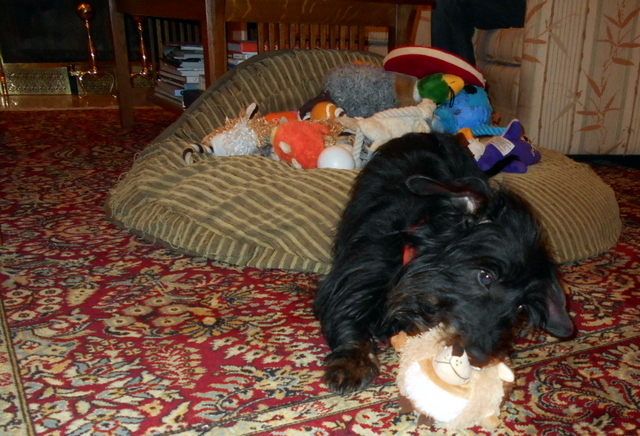 Luckily, Penny also gave me a blue tug toy that I named Smiley that I have been very interested in to start. 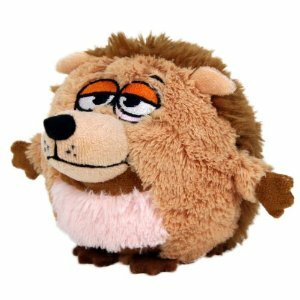 We’ll have to see if Smiley has more staying power than Leppy, the Bear and other squeaky toys that have temporarily won and then lost my favor. It’s tough on the new toys: I get excited when I first see them, but after a few days, when it’s time for a spirited tug of war, you can’t really beat good ol’ Ropey. I understand; finding the right gift toy is hard. 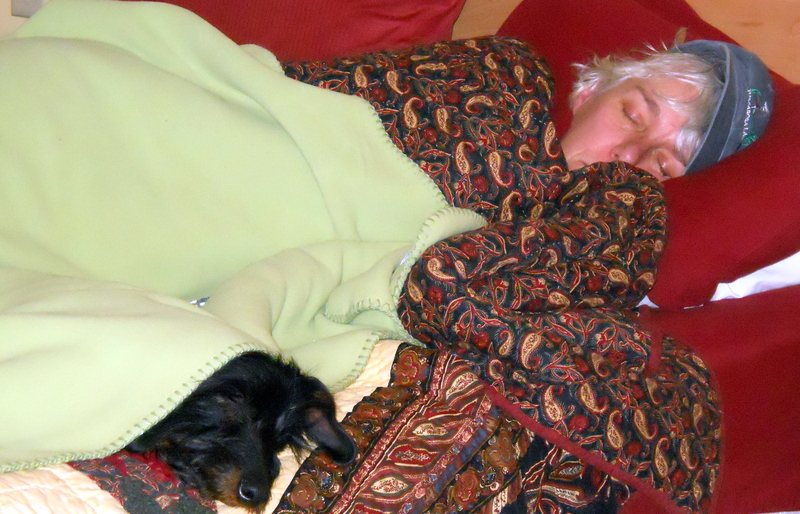 Frankly, I prefer the holiday gift strategy adopted by my extra special best friend Lynn (who dropped off yummy pumpkin biscuits) and my beloved aunts Susie and Debby from Syracuse (who sent long-lasting rawhide chews and tasty jerky treats): Don’t bother with dog blankets, balls or toys. Just send food. However, as Mike and Heather took down the Christmas cards and put away the holiday decorations for another year, I realized that none of the toys or other gifts I received could really overcome my disappointment over the one thing I didn’t get: Those antlers that sat atop the TV cabinet for two weeks as I pined away from afar, ultimately unrequited. It will have to be wait ’til next year, I guess. 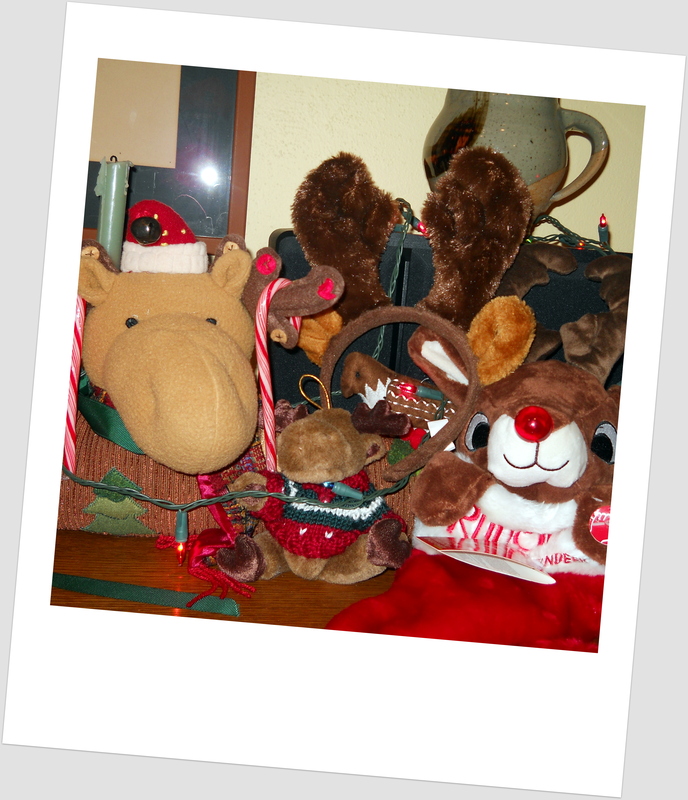 Santa Moose, Moosey Jr., Rudolph and a set of antlers on top of the TV cabinet: Out of reach, but not out of mind. I ran away from Mike just before dark, chasing rabbits through the South Meadow, and he had to search for me with a flashlight (I was back home on the front porch, scratching on the door and barking for somebody to let me in). Even so, he didn’t seem that pissed at me until he came out of the bathroom and saw me with the card. When they slide the door closed, I’m not allowed to go into the bathroom with them. I don’t like this, but what can I do but whimper? 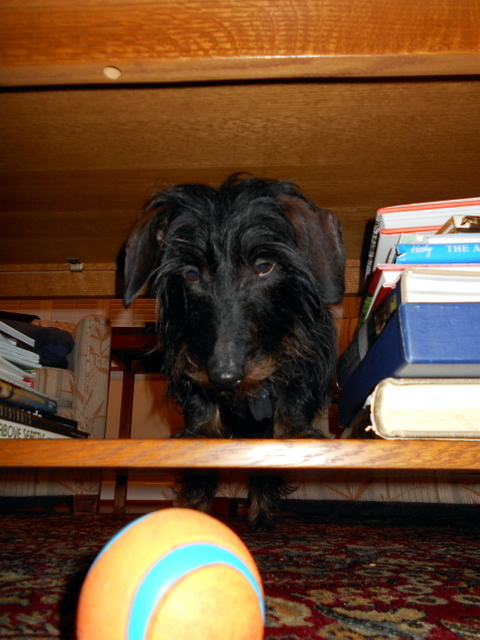 But this day, I had an opportunity to grab a Christmas card that had fallen on the floor and start chewing it. What fun! If I had realized the card came from my best friend Lynn, maybe I wouldn’t have eaten part of it, but what’s done is done. But it was chewing the card that seemed to put Mike over the edge. I tried to run away from him with the card still in my mouth, so I could bury it somewhere, but Mike yelled, loudly, and I just dropped the card and lay still. I could tell that Mike meant business this time, and I better not mess with him. I got the silent treatment for a long time. That little incident put me on my best behavior until Christmas, however. I’ve already figured out that a couple of days before Christmas is a bad time to be naughty. My stocking is already hanging on the fireplace mantel, and when it went up I understood why Mike hadn’t put them up last week with the other decorations: He decided the stocking we had were ratty-looking, didn’t match, and were generally no longer up to MY lofty fashion standards. So Mike got us three new ones, each individually stitched with our names. The photos here don’t really do them justice, since you won’t able to appreciate how soft and plush they are. 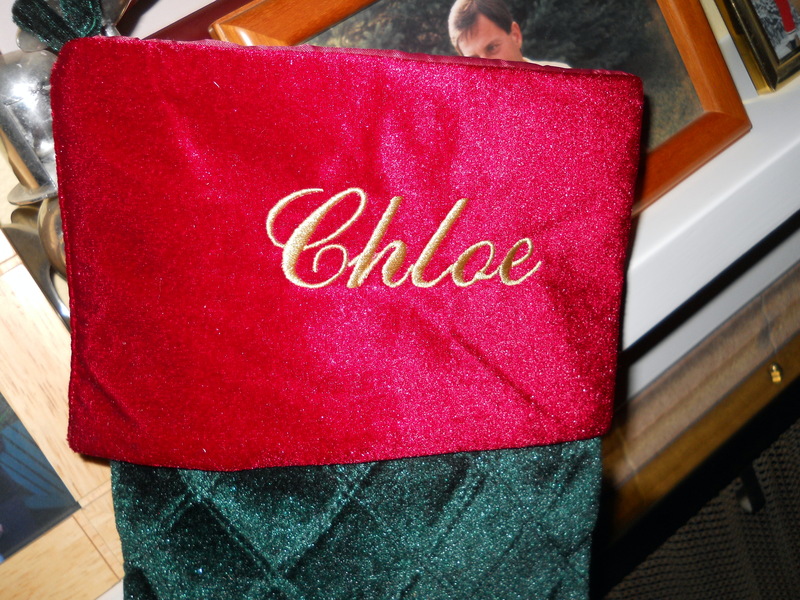 My stocking is green with burgundy trim, while Heather’s and Mike’s are the opposite, burgundy with green trim. Mine is thus appropriately distinctive; even in the dark of night, Santa will always be able to pick mine out from theirs, unless we somehow get a red-green colorblind Santa. Most importantly, all three stockings are now the same size, and all toes face in the same direction. To me, that’s the key element of a balanced holiday mantel design. A few days later, however, I realized there were two things my stocking lacked: It was empty, and it didn’t have antlers. If for the next couple of days I’m nice and not naughty, the first problem would take care of itself on Christmas Eve while I’m fast asleep in my crate in the bedroom. I know Mike has been hoarding biscuits that Lynn dropped off (unless she retracts them when she finds out that I chewed up her Christmas card). I also heard Heather tell Mike that she had gone shopping to get some new toys for me. Heather has good taste. And I have already sniffed out the presents for me in the package my aunts in Syracuse sent, as well as the gold bag on the coffee table that my pal Penny and her parents sent over. Not wanting to jeopardize my access to all these gifts that are so rightfully mine, reining in my naughty ways is paramount to success in my immediate future. That’s where the antlers come in. I’ve developed an inexplicable attraction to antlers ever since Mike took those silly pictures of me for my holiday greeting card. Why, I have no clue, but ever since Mike put those antlers on a vase in the living room right over those two stuffed moose decorations, I have camped under those antlers, desiring them without success. Then Heather brought home a Rudolph the Red-Nosed Reindeer musical stocking from her office present swap and put it on top of the TV next to the moose, and now all bets are off regarding control of my imminent behavior. Why? Because when you touch Rudolph’s paw, his nose lights up red and a chorus sings his reindeer song as his antlers move back and forth in time with the music. Rudolph is wonderful, and I can’t take my eyes off him or his antlers. I want to possess them, and Mike and Heather won’t let me. The cruelty of it all. Will I be able to resist temptation through Christmas Eve and remain sufficiently well-behaved so I can get my presents? In the best interests of all concerned, I would advise Mike and Heather to stay out of the bathroom until Christmas, or at least not to shut the door . You can never tell what I might do when that door slides shut.